Drug Channels: Who Best Managed the Drug Spending Slowdown in 2017: CVS Health, Express Scripts, MedImpact, or Prime Therapeutics? Who Best Managed the Drug Spending Slowdown in 2017: CVS Health, Express Scripts, MedImpact, or Prime Therapeutics? Drug spending grew by only 1.5% in 2017, continuing a multiyear decline in the growth rate. Total drug spending declined at more than 40% of plan sponsors. Spending on traditional drugs dropped by mid-single digits. 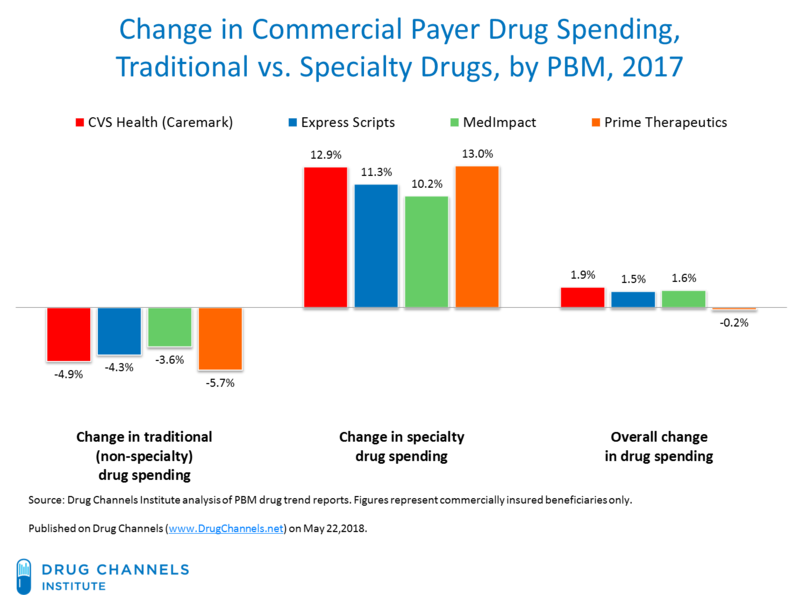 For specialty drugs, higher utilization was a much bigger contributor to spending growth than was growth in unit costs. The 2017 data figures show that PBMs’ negotiating abilities continue to put spending growth in a squeeze box. Unfortunately, the warped incentives of the gross-to-net bubble and plan sponsor cost-shifting mean that patients do not always get on the magic bus and benefit from the low trend figures. Here are links to the four PBMs’ 2017 drug trend reports. As always, I encourage you to review the source materials for yourself. The larger PBMs that are owned by health insurers—Aetna, Humana, and OptumRx (UnitedHealth)—don’t publish drug trend reports. As far as I know, none of the smaller PBMs releases any information on management of drug trend. In this one page advertisement, OptumRx revealed only its overall drug trend for the first nine months of 2017. An OptumRx spokesperson denied Drug Channels’ request for further information or clarification. We therefore had to exclude data from the third-largest PBM, making me not a happy jack. Note that our comparison focuses only on commercial payers: employers and health plans. Those are the only data reported by CVS. Express Scripts provided separate trend figures for Medicare, Medicaid, and Exchanges. Prime and MedImpact provided separate trend data only for Medicare and Medicaid. The chart below shows the unweighted average drug trend figures for the past four years. Note that not every PBM contributed data in every year. As you can see, changes in drug spending have dropped continuously over the past four years. These data provide a comprehensive picture of the overall commercial payer market. That’s because these PBMs accounted for the vast majority of U.S. retail, mail, long-term care, and specialty equivalent prescription claims. 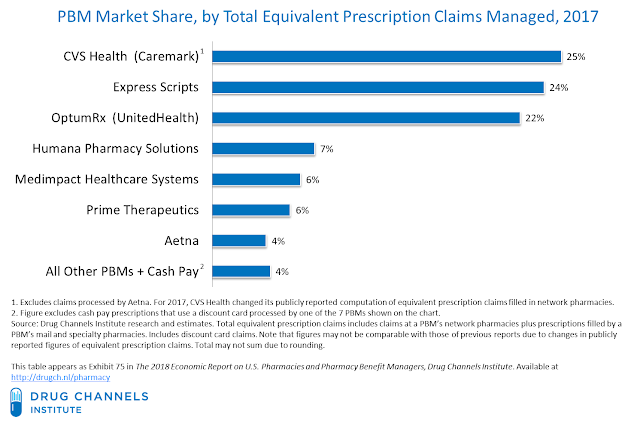 See our chart: PBM Market Share, by Total Equivalent Prescription Claims, 2017. The chart below summarizes the reported 2017 commercial drug trend figures from four PBMs: the Caremark business of CVS Health; Express Scripts; MedImpact; and Prime Therapeutics. Spending growth on traditional drugs declined as generic dispensing rates grew and rebates increased. See Payer Power: Why Eli Lilly, Janssen, and Merck Deeply Discount Their Drug Prices. 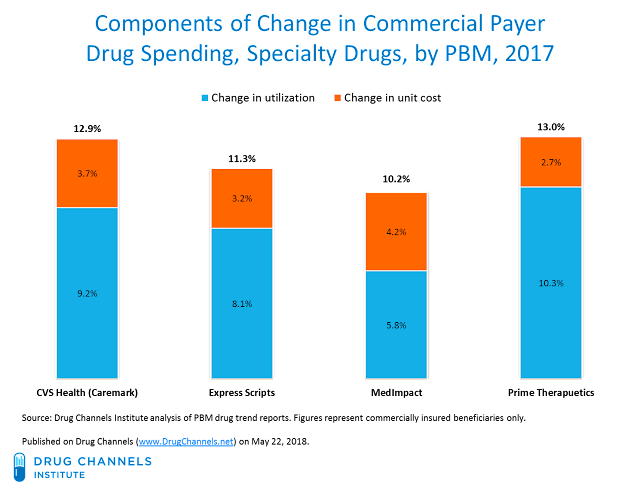 Specialty drug spending grew by 10% to 13% for the commercial clients of these PBMs. 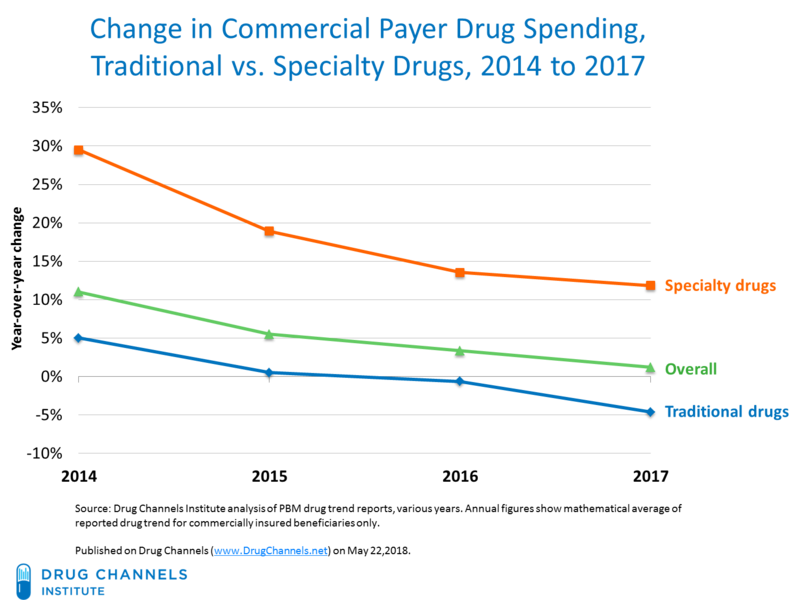 As I discuss below, the major component of specialty spending growth was an increase in the number of people being treated and in the number of prescriptions being dispensed. The two largest PBMs also provided the share of their clients that experienced negative trend, i.e., the payers that spent less on pharmacy benefit drugs in 2017 than they spent in 2016. More than 40% of their PBM clients experienced year-over-year declines in drug spending. Note that OptumRx was the outlier. Its clients experienced a 2.7% increase in drug spending. Perhaps that’s why Optumrx elected not to publish a report for 2017? Unit costs—the payer’s cost per unit of therapy. 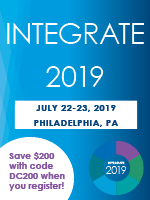 Unit costs vary with (1) the rate of inflation in brand-name drug prices, (2) shifts to different drug options within a therapeutic class, (3) a shift in mix of therapeutic classes utilized by beneficiaries, and (4) the substitution of generic drugs for brand-name drugs. Utilization—the total quantity of drugs obtained by a payer’s beneficiaries. Utilization varies with (1) the number of people on drug therapy, (2) the degree to which people adhere to their drug therapy, and (3) the average number of days of treatment. The total change in spending equals the sum of changes in unit cost and changes in utilization. 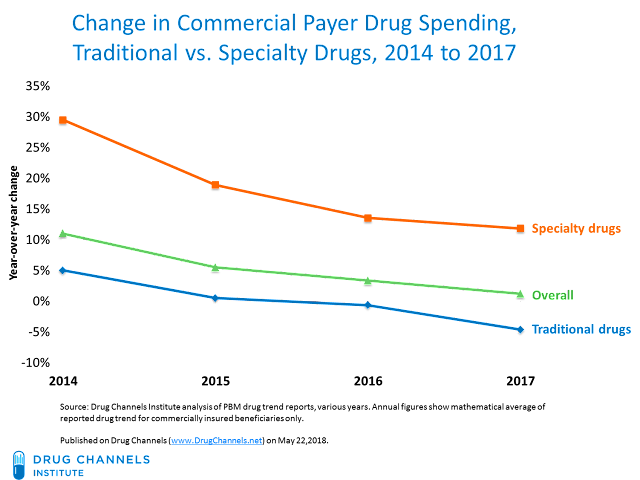 The chart below deconstructs changes in spending for specialty drugs. 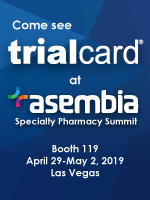 The data clearly show that nearly two-thirds of specialty drug spending growth can be attributed to the growth in the number of people being treated and the number of prescriptions being dispensed. For Caremark’s commercial clients, the 9.2% utilization increase accounted for more than 70% of the 12.9% increase in specialty drugs’ spending. Utilization growth can be considered a positive trend, because it is well established that pharmaceutical spending reduces medical spending and improves patients’ health. These data also provide another unpleasant implication behind the growing adoption of copay accumulators—which, I believe, will decrease utilization of specialty drugs. See problem 2 described in in Copay Accumulators: Costly Consequences of a New Cost-Shifting Pharmacy Benefit. Clearly, drug spending is not spinning out of control. Pharmacy benefit costs are growing much more slowly than is growth in other part of the U.S. healthcare system, such as hospital spending and physician salaries. Most of us are benefiting from these trends. That’s because the vast majority of people pay little out-of-pocket for their prescriptions. (Many generic prescriptions now say: “I’m free!”) Check out the Express Scripts data that I shared in Exclusive Express Scripts Data: Most People Have Very Low Out-Of-Pocket Prescription Costs. The CVS Health figures on page 12 of its report tell a similar story. Almost 97% of Caremark beneficiaries spent less than $1,000 out-of-pocket in 2017. However, we shouldn’t celebrate just yet. People in high-deductible plans or taking specialty drugs are paying more for their prescriptions, courtesy of the gross-to-net bubble. The warped incentives that allow payers to capture savings at the expense of the sickest patients is behind the Trump administration’s controversial drug pricing plan. Our country’s collective challenge will be to harness the positive aspects of the PBM model while altering the economics of the drug channel. Let’s hope we don’t get fooled again. P.S. 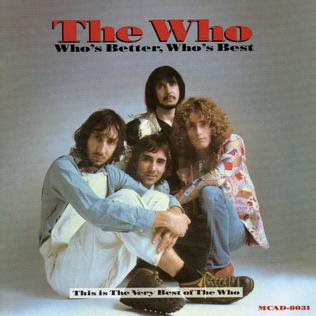 Today’s post is brought to you by The Who! CORRECTION: Prime Therapeutics published separate trend reports for commercial, Medicare, and Medicaid. We incorrectly stated that it only published a commercial report. We apologize for the error.